These tips for parents of children with learning disabilities emphasize to all parents the importance of helping children learn about letters and sounds. Get concrete advice for teaching the alphabet, raising awareness about sounds, and promoting letter-sound knowledge. Parents can have a strong positive influence on their child's reading. Research has shown that enjoying books with a child for even a few minutes a day can make a measurable difference in the acquisition of basic reading skills, and that everyday activities – such as a trip to the grocery store – can be turned into enjoyable learning experiences. The following is a list of ways in which parents can encourage the development of the skills needed by children in order for them to become good readers. Find time to read aloud with your child every day. Typically, parents play an important role in developing this skill by reading to children and showing how important reading is to their daily life. Lap time with picture books and stories can strongly motivate your child to enjoy reading. Try to make these books available for your children to explore and enjoy on their own as well. Teach about books. When reading aloud to your child, let your child open the book and turn the pages. Point to the words as you read. Draw attention to repeated phrases, inviting your child to join in each time they occur. Point out letters and words that you run across in daily life. Make an obvious effort to read aloud traffic signs, billboards, notices, labels on packages, maps, and phone numbers. Make outings a way to encourage reading by showing your child how printed words relate to daily living. Play alphabet games. Sing the alphabet song to help your child learn letters as you play with alphabet books, blocks, and magnetic letters. Recite letters as you go up and down stairs or give pushes on a swing. A-B-C, dot-to-dot and letter-play workbooks, games, and puzzles are available at most toy stores. Many engaging computer games are designed for teaching children letters. Make sure these toys are available even when you are unable to play along. Watch Sesame Street with your child. Show the child how to sing along, answer the riddles, and engage actively in its fun. Make writing materials available to your child and encourage their use. Help your child learn to write his/her name and other important words or phrases. Gradually, help the child learn to write more and more letters. At first, most children find it easier to write uppercase letters. Teach your child to spell a few special words, such as his/her name, stop, or exit. Challenge the child to read these words every place they are seen. Draw attention to these and other frequently occurring words as you read books with your child. Challenge the child to read these words as they arise or to search them out on a page. Play word-building games with letter tiles or magnetic letters. Have the child build strings of letters for you to read. Sing songs and read rhyming books. Sing the alphabet with your child, and teach your child songs that emphasize rhyme and alliteration, such as "Willaby Wallaby Woo" and "Down By the Sea." Emphasize the sounds as you sing. Play rhyming games and clap out names. Jumble the wording or word order of familiar poems and challenge your child to detect the error. Talk like a robot, syllable by syllable. Play word games. Challenge your child to play with words. For example, ask your child to think of words that rhyme with bat or begin with /m/. What would be left if you took the /k/ sound out of cat? What would you have if you put these sounds together: /p/ and ickle; /m/ and ilk; and /s/, /a/, and /t/. Which of these words starts with a different sound – bag, candy, bike? Do boat and baby start with the same sound? Sound out letters. Point out other words that begin with the same letter as your child's name, drawing attention to the similarities of the beginning sound. Use alphabet books, computer games, or car games such as, "I'm thinking of something that starts with /b/" to engage the child in alliterative and letter-sound play. If you have a book that lends itself to alliteration and rhyme, such as a Dr. Seuss book, sound out rhyming words as you read or challenge the child to do so for you. Play word games that connect sounds with syllables and words. For example: If this spells cat, how do you spell hat? Point out new words. As you encounter them, say the sound while touching each letter in a new word. For example, say "s-u-n" and then blend sounds to create the word. In practicing new words, use predictable words with common sounds and spellings, like fun or sat instead of night or saw. If you encounter words with unknown meanings or with complex spellings, encourage your child to try to sound out the words. However, if too many words require this kind of attention and effort, it is best to find an easier book. Play spelling games with your child. After your child begins pronouncing words, encourage spelling by saying each sound in the words and then writing the letter that goes with the sound. Encourage your child to spell. After your child has learned to pronounce words, have the child say each sound. Independent writing. Encourage your child to use inventive or independent spelling. At this stage, the child will tend to omit letters and confuse letter names with letter sounds, producing such spellings as LFNT for elephant, BN for bean, and FARE for fairy. Use correction wisely. What you should be most concerned about is the child's sensitivity to the sounds that need to be represented. 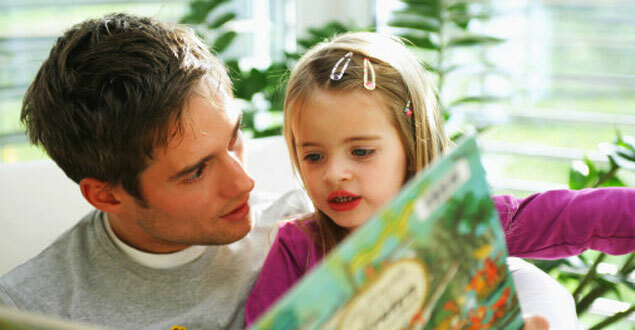 Help your children to read easy, enjoyable stories as often as possible. It is likely that your child will enjoy reading more and learn more from reading if you sit together, taking turns reading and encouraging discussion. In the beginning, invite the child to read well-chosen words. Gradually, as the child becomes able, take turns with sentences, speakers, paragraphs, and pages. At the end of each section or story, revisit those words that caused trouble. Rereading the entire story over several days, and again weeks later, is a powerful way to reinforce this learning. Now it becomes useful to point out the similarities between words such as will, fill, and hill or light, night, and sight. This is also the time to help your child learn the correct spelling of the words he/she writes. Pause for discussions as you read. As you read stories to and with your child, stop frequently to discuss their language, content, and relevance to real life and other knowledge. Pause to explore the meanings of new words, using them in other sentences and contrasting what they mean with words that have similar meanings. Make an effort to revisit new words and concepts later, when the book has been put aside. When reading stories, pause to discuss the various characters, problems, events in the story, and invite your child to think about how the problems might be solved or to wonder about what might happen next. When resuming a story, ask your child to review what has happened so far, drawing attention to looming mysteries and unresolved conflicts. In reading expository text, invite the child to marvel at the creatures or events described and to wonder about details or connections not mentioned by the text. Above all: read, read, and re-read. Excerpted from: Learning to Read/Reading to Learn: Helping Children with Learning Disabilities to Succeed. (1996). National Center to Improve the Tools of Educators. ERIC Clearinghouse on Disabilities and Gifted Education, Council for Exceptional Children.